This Belfast Spanish guitarist taught himself to play flamenco guitar while at University and is available for Spanish themed events in Northern Ireland. This Belfast Spanish guitarist I taught himself to play Spanish classical guitar while at Edinburgh University. After graduating, he returned home to Belfast during which time he took up traditional fiddle playing studying with the great Cavan fiddler, Sean Maguire. 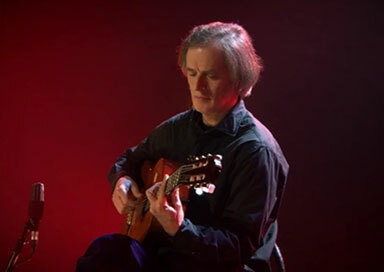 In 1989, he went on a two-week course of flamenco guitar in Cordoba playing all day and all night for the entire fortnight and he has been hooked on flamenco ever since, regularly returning to Spain to study and listen to flamenco. He feels flamenco allows him to let go and enjoy the experience, whether you're the performer or in the audience.